Thank you so much to everyone who sent in photographs showing local wasted spaces in response to our campaign. 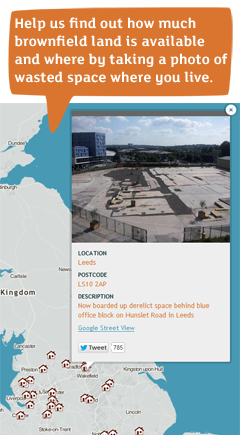 We've added these to our online map which now shows over 250 wasted spaces across the country. The map highlights the brownfield land in our towns and cities that could be regenerated to create thriving communities instead of building on precious countryside. You can see the updated map: #WasteOfSpace map. I'm sure there are many more wasted spaces yet to be spotted that could be added to the map. It's really easy to get involved, just take a photo of a wasted space and send it to us by email or share it on our Facebook and Twitter pages. If you could also give us the street and postcode and a short description that would help us pin it on our map. We'll be updating our map every week, so just check to see if your photo has been added. 1. The right housing in the right places: we want to see more intelligent planning policies so more countryside is saved from unnecessary and damaging developments. 2. The right infrastructure for the right reasons: we want to make better use of existing transport and energy infrastructure to avoid wasting precious countryside. 3. A beautiful countryside to sustain us all: Government policies need to value and protect the countryside, which does so much to support our health, prosperity and wellbeing. Why our manifesto is so vitalEngland’s beautiful countryside is a national asset, famous the world over and hugely valued by local communities. At the same time, it is under huge and increasing pressure as the desire for short-term economic gain drives the political agenda. The result is often careless housing, transport and energy developments that damage the countryside unnecessarily. We know there are viable alternatives that will bring our country the housing and development it needs, without destroying precious countryside. I'll be telling you how you can help us push for them in our next issue of Campaigns update. The next few months are a pivotal time as polictical parties hone their policies ahead of the election. 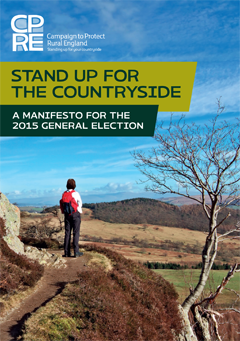 With the help of our manifesto, we want to ensure the countryside benefits, whoever forms the next Government. It is only thanks to wonderful supporters like you that our vital campaigning work is possible. Thank you so much for standing up for the countryside at this critical time. Please forward this email to your friends to encourage more people to spot the wasted spaces in our towns and cities. CPRE fights for a better future for the English countryside. We work locally and nationally to protect, shape and enhance a beautiful, thriving countryside for everyone to value and enjoy. Founded in 1926, we're a grassroots organisation, with more than 200 local groups, a branch in every county and 60,000 members and supporters. CPRE is a registered charity (1089685) and a company registered in England (4302973).